Opera web browser for Linux available as a Snap -- install on Ubuntu, Fedora, Mint, and more! There is no shortage of web browsers for Linux. Two of the most popular browsers -- Google Chrome and Mozilla Firefox -- are easy to install and work quite brilliantly. Another fairly popular option is available too -- Opera. All three aforementioned browsers are cross-platform, making them great options not only for Linux, but Mac and Windows too. Today, the Opera web browser for Linux becomes available as a Snap. If you aren't familiar, this means it is packaged for installation on any Linux distribution that supports Canonical's Snap format. This has the benefit of helping the developer, as they don't have to waste resources with multiple packaging options. 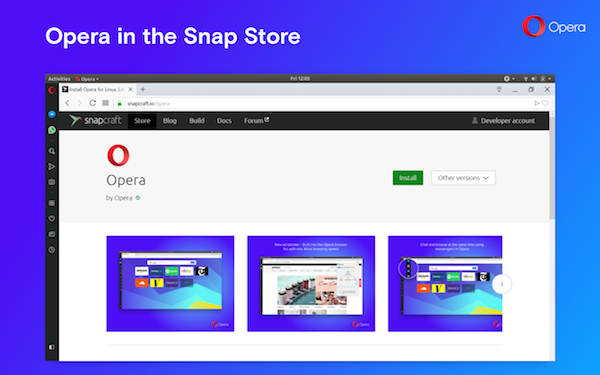 "The addition of Opera to the Snap Store enables users of all major Linux distributions to benefit from the auto-updating and security features that Snaps provide. The Opera snap is supported on Debian, Fedora, Linux Mint, Manjaro, Elementary, OpenSUSE, Ubuntu and more distributions," says Opera. Jamie Bennett, VP of Engineering, IoT and Devices at Canonical says, "We are delighted to welcome Opera to the Snap Store and further expand the choice of applications available to the Linux community. It is popular applications, such as Opera, that have driven the impressive growth of new snaps to the store and ever-increasing user installs over the last year." To install the Opera snap, simply go here. You can also install it from terminal by typing "sudo snap install opera" without quotes. I used the terminal option to install on my Fedora machine, and it went flawlessly. With that said, running the browser was a different story. Performance seemed sluggish, and font rendering on some websites was a bit wonky. I'll be sticking with Mozilla Firefox as my go-to web browser for now.